Learn more and enroll in the D*action Breast Cancer Prevention Project to test your vitamin D level, and with the new myData-myAnswers personalized health software, get feedback on your health conditions compared to 1000’s of others so you can make more informed decisions on your actions. After 3-6 months on your new program, test again. A 2018 pooled analysis of a randomized trial and a prospective cohort study by McDonnell et al. found that women who were 55 years of age or older with a vitamin D serum level of 60 ng/ml or greater had an 80% reduced risk of breast cancer compared to those with a vitamin D level of 20 ng/ml or less; 3 different analyses of the data showed similar results. A 2016 pooled analysis of a randomized trial and a prospective cohort study by McDonnell et al. found that women who were 55 years of age or older with a vitamin D serum level of 40 ng/ml or greater had a 71% reduced risk of cancer compared to those with a vitamin D level of 20 ng/ml or less. A 2013 case control study at UCSD School of Medicine, Mohr et al. 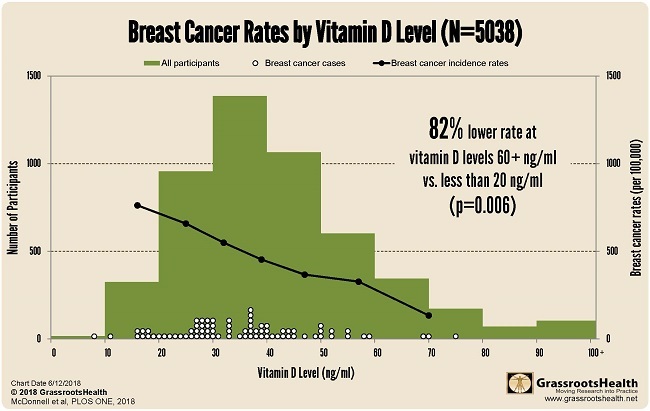 found that the three months prior to tumor diagnosis was a relevant window of time for cancer prevention and that those with vitamin D levels ≥35 ng/ml had a 70% reduction in risk of developing breast cancer than those with levels <15 ng/ml. Bilinski et. al. demonstrated in a 2013 case control study that women with 25(OH)D levels ≥30 ng/ml had an almost 60% reduction in risk of breast cancer compared to those with levels <10 ng/ml. Among women younger than 50 years old, there was a 71% reduction in risk and among women 50 years and older there was a 55% reduction in risk. In a 2012 case control study, Yao et. al. found that women with 25(OH)D levels ≥30 ng/ml had more than a 60% reduction in breast cancer risk compared to women with levels <20 ng/ml. Among post-menopausal women, there was a 71% reduction. In a 2012 case control study, Peppone et. al. found that those with 25(OH)D levels ≥32 ng/ml had an almost 60% reduction in breast cancer risk compared to women with levels ≤20 ng/ml. In a 2009 case control study, Abbas et al. found that women with 25(OH)D levels ≥24 ng/ml had more than a 50% reduction in risk of pre-menopausal breast cancer compared to those with levels <12 ng/ml. In a 2009 case control study, Rejnmark found that pre-menopausal women with 25(OH)D levels ≥34 ng/ml had more than a 60% reduction in breast cancer risk compared to women with levels <24 ng/ml. In a 2009 case control study, Crew et. al. 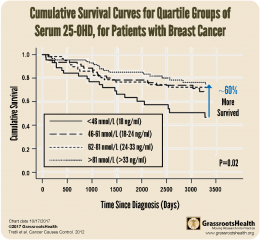 found that post-menopausal women with 25(OH)D levels ≥40 ng/ml had more than a 50% reduction in breast cancer risk compared to women with levels <20 ng/ml. In a 2008 case control study, Abbas et al. found that those with 25(OH)D levels ≥30 ng/ml had an almost 70% reduced risk of post-menopausal breast cancer compared to those with levels <12 ng/ml. A 2007 randomized clinical trial at Creighton University led by Joan Lappe, PhD, RN, FAAN, found that a dose of 1100 IU/day of vitamin D along with 1400-1500 mg/day of calcium helped women aged 55 and older raise their average serum vitamin D level to 38 ng/ml (from a baseline of 29 ng/ml) and prevent approximately 4 out of 5, or 80%, of all invasive cancers including breast cancer. Lowe et al. demonstrated in a 2005 case control study that women with serum levels of >60 ng/ml had more than a five-fold (80%) reduction in breast cancer risk compared to women with levels <20 ng/ml. What’s your vitamin D NOW? by Dr. Cedric F. Garland, Dr. P.H. We have closely followed the stories in the Times about the mammography controversy. The coverage has been thorough and superb. The controversy is about a procedure that, at best, reduces mortality by 15% and does nothing toward primary prevention. It is not widely realized that most breast cancer is preventable. While the scientific literature reveals many strategies for prevention of breast cancer, the simplest is elimination of the vitamin D deficiency. This is the main known cause of breast cancer. 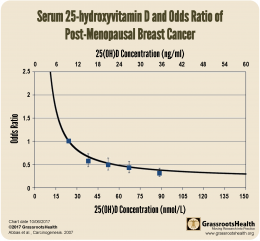 Raising the serum 25-hydroxyvitamin D level to 40-60 ng/ml could prevent 75-80% of breast cancer incidence (and deaths, of course). While deciding on the issue of mammography, action can be taken today to raise the serum 25-hydroxyvitamin D to appropriate levels. Cedric F. Garland, Dr. P.H., F.A.C.E.